Welcome to the new year! 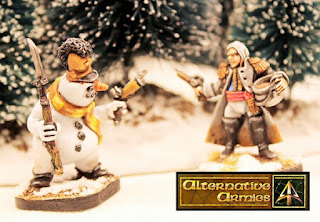 Alternative Armies begins this annum with the eighth free scenario for Flintloque in the Dark Czar arc is now online for free! Snowballe Volley sees playtest rules as well as a large scale fight against animated snowmen. Links to this and to other scenarios in the arc are in the article. Before Cryptmass we sold out of the beginners box set 5024 and I am delighted to now say it is back in stock! It is going to be a hell of a year. I get a kick out of these figures, bet games are a load of fun. Thank you. I think they are, no game like it. Looks great. Hoping to start building a couple armies later this year. Cool and thanks. When you get around to placing your order send me an email on sales@alternative-armies.com quoting TMP and your order number and I will put a wee free Flintloque gift in it.